What is old is new again, especially on the topic of cover crops. My father frequently mentioned that his Uncle Frank planted winter rye on the family farm in the Czech Republic in the early 1900s. Farmers and home gardeners have for many years utilized winter ground covers to minimize the effects of wind, frost and water on fallow soils. In recent years we have learned that ground covers are important for another reason: soil is alive, and cover crops maintain the microbial life essential to healthy plant growth. Cover crops are called green manure because it is an efficient way to add nutrients to the soil. Winter cover crops are sown in the fall to grow during the winter, and are turned into the soil in the spring. Bare soil is losing its nutrients, especially carbon and nitrogen. Our plants and the soils’ microorganisms need nutrients, especially nitrogen to grow. Organic material (cover crops) help replenish the soils’ microorganisms in the soil for the next season of planting. Cover crops add organic material (carbon) to the soil, especially in the spring when turned into the soil to decompose, or simply mowed before planting. Cover crops also improve the soil’s structure by maintaining the soil microorganisms that help plants send their roots deeper into the soil. Good soil structure can hold onto moisture longer, especially in time of drought. Organic matter also contributes to better health and disease resistance of our plants. Cover crops can be divided into legumes and non-legumes. Vetch and red clover are leguminous cover crops and their talent is to contribute more nitrogen into the soil when they decompose. Other winter cover crops are grains (non-legumes) such as oats, annual rye or winter wheat, barley, millet, mustard. Cover crops can also be used during the growing season as part of the vegetable crop rotation in your garden. Examples of summer cover crops are soybean, black bean, buckwheat. Chicory, comfrey, yarrow, nettles, and even dandelions are examples of perennial cover crops. The most common winter cover crop is winter rye. Winter rye will remain green even under the snow, and will resume growth in the spring. However, for that reason winter rye can be a problem when it comes time to plant: it gets too big to be tilled under easily. And tilling creates another problem because it disrupts the microbial life that we are trying to protect. Winter Rye also has an allelopathic effect. It should be cleared totally out of the garden, preferably earlier than you plan to plant in the spring. For all these reasons, raised beds (such as the beds at the Northampton Community Garden) are planted with a combination of oats and vetch. Both should sprout and grow even in the short cool days of fall. Oats will die back with hard freeze (though it may last until the ground freezes) and vetch will sometimes last even beyond that. But both will die back, and create a surface mulch that will protect the soil, yet enable spring planting with a minimum of soil disruption. Carol W: Why did you decide to use cover crops in your garden? I had used buckwheat for years, mainly for weed control and nitrogen fixing. Then I learned about new research in soil biology and carbon sequestration. When did you use cover crops in your garden? Summer for weed control. Have you used winter and/or summer cover crop(s)? Yes, now I use both. What were the specific plants that you choose for your cover crop(s)? For summer, I use a NOFA (Northeastern Organic Farm Association) bulk mix that they call "Winter Kill Cocktail". My list of exact contents of the mix is at the Northampton Garden, but it has buckwheat, oats, sorghum, daikon radish, and field peas. For winter, at first we used rye, but that is hard to eradicate in the spring. Last year, we spread oats and vetch. The vetch survived even in the raised beds, because of the easy winter, and it too was a bit hard to incorporate when we needed to plant. So this year, we've mixed field peas and oats. Hope that I didn't wait too long to get them in the ground. How would you rate the success of your cover crop(s)? This year we had some trouble with germination due to the drought. Would or have you decided to use cover crops again? Yes; I think that we should expand and use covers between rows as well as during fallow periods. Any advice for new or experienced gardener? 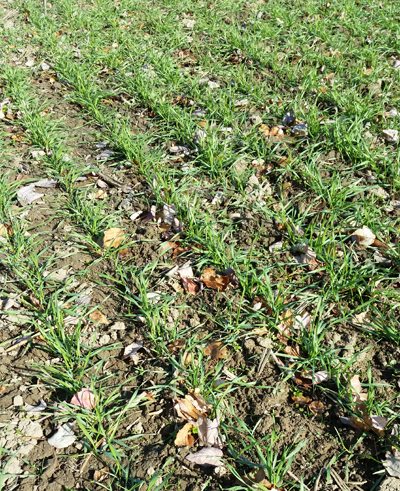 NOFA suggests using the winter kill mix in areas where you want to plant early cold weather crops and letting the frosted die back function as mulch over the winter. Use the winter hardy (or hardier) mix in areas that will be planted later in warm weather crops. That is a bit hard for us at the Northampton Community Gardens because we use small area intensive plantings. I think for us the next experiment will be in using the covers as interplantings. Sue K: I've used buckwheat and oats. A lot of community gardeners use winter rye, but you can't plant for a while once you pull it out, and it spreads rapidly. Leslie F: Yes, I have used buckwheat. Note: Buckwheat is a short-season crop (10-12 weeks), well suited for a cover crop. It grows especially well on low-fertility or acidic but well drained soils. There is no need to fertilize after planting. Too much fertilizer will reduce yield. The seed can be harvested and ground like wheat for use in baking. Nancee B: Last year we planted oats (grain). This year is oats (grain) and field peas (legumes). Next year will probably be rye and clover. The oats and field peas were just planted (week of Oct 17), in time for the forecasted rain. With no hard frosts predicted for the next 2 weeks, the seed should germinate and begin growing. We do not till our field; just removal of the surface cover crop material in the spring, leaving most of it for compost, and then some raking before planting. Our goal is to improve the quality of the soil, building its nitrogen and carbon for sustainability. This past summer we planted in little hills; sunflowers, beans, and squash. This year’s yield of squash that was planted after the winter cover crop (oats) was abundant, doubling the output of previous years. We will continue to use cover crops, along with leaf and grass mulch in our field. We do crop rotation every year because plant diversity has been shown to be a major factor in plant health and resistance to diseases. We do not use pesticides. With last week’s snow and the frost this morning, the time to plant a cover crop may be lost for this winter. You can still protect and feed your garden’s soil with a layer of mulch, such as 2 to 3 inches of humus (composted material), shredded leaves, or straw. Make a note to include cover crops in your summer and winter plantings in 2017.